Indulgence and the winter holidays go together like, well, turkey and gravy, or Christmas pudding and hard sauce. And indulge we should — but with good health and a fresh new year in mind. Don’t get me wrong; I love the holiday season's traditions and comforting foods, such as my mom’s amazing stuffing, pumpkin pie with vanilla ice cream, cocktail parties, and candy canes. But it’s often easy to overdo it when Thanksgiving starts a month-long string of parties, dinners, happy hours, goodies around the office, and festivities. This is when indulgence gets the best of us. We all worry about holiday weight gain and try to lose it (or say we will) in January. Americans do gain weight over the winter holidays: on average, one pound per person. That's not much, but according to a report in the New England Journal of Medicine,_ the problem is that we seldom shed that extra pound. So year after year, those pounds add up. In the long run, a substantial amount of weight gain can have a significant impact on our health, increasing our — sorry to sound grim here — risk of cardiovascular disease, diabetes, and high blood pressure, among other worries. By being mindful and keeping tabs on portion sizes, and working indulgences in only occasionally, we can do much to prevent the pounds from piling on over the years. And let’s not forget that there’s actually quite a bit of good-for-you fare on the holiday table. You just have to know where to look. A good source of vitamin C and fiber, cranberries are packed with disease-fighting antioxidants and may help lower cholesterol levels and the associated risk of heart disease. Research also cites the cranberry’s ability to prevent kidney and urinary-tract infections. However, the calories in cranberry sauce can rack up quickly, thanks to the sugar found in canned and jellied sauces. Try to cut down on the sugar by making a less-sweet fresh cranberry sauce: Combine 1/2 cup sugar and 1 cup water, and set it to boil on the stove. Add 2 cups cranberries and cook for five to 10 minutes, until the cranberries have softened but not lost their shape. Check out, too, Culinate's holiday recipe for Spiced Cranberry Sauce. Brussels sprouts are a fantastically nutritious addition to your holiday plate. Cousins of the cabbage, Brussels sprouts are loaded with dietary fiber to keep our digestive systems running strong. They also enhance the body’s natural disease-fighting capabilities, particularly against cancer; these nutrient powerhouses help detoxify the body and bolster healthy skin and immunity. Brussels sprouts are an excellent source of vitamin C; a 1-cup serving boasts more than 161 percent of your daily recommendation. Sprouts are also a good source of vitamin K, folic acid, and vitamin A.
Here’s a simple recipe to try: Browned and Braised Brussels Sprouts. Possibly one of the most healthful root vegetables and complex carbohydrates out there, sweet potatoes are king when it comes your Thanksgiving table. Why not eat them through the winter? Sweet potatoes and yams are rich in antioxidants, vitamin A, and beta-carotene; one serving has nearly 260 percent of the daily recommendation. They’re also good sources of vitamin C and dietary fiber. Because they’re naturally sweet, sweet potatoes don’t need much added sugar. The added sugar in traditional side dishes like candied yams and sweet-potato casserole can add a lot of unnecessary calories. Try something on the lighter side this year, like simply roasted sweet potatoes. Pumpkin is one of the most nutritious fall vegetables out there. A type of winter squash, it's packed with the carotenoid beta-carotene, a type of antioxidant that helps prevent cancer and gives pumpkin its vibrant orange color. Pumpkin also contains other types of antioxidants — lutein and zeaxanthin — which promote eye health and lower the risk of macular degeneration. Pumpkin tops nutritional charts in vitamin C and potassium, and is a good source of dietary fiber. Finally, don’t forget pumpkin seeds, which contain heart-healthy omega-3 fats and may help lower cholesterol levels. All of which means that yes, we’ve even found the health in Mom's Pumpkin Pie. 'Tis the season for citrus: grapefruits, oranges, and myriad others. Citrus fruits help boost immunity to fend off that pesky, impending cold, and the potassium, fiber, folate, and antioxidants in these wintry fruits work together to protect against cardiovascular disease. Just half a grapefruit contains almost 80 percent of your daily recommended intake of vitamin C. Pink grapefruits' rosy hues are a good source of the disease-fighting antioxidant lycopene. Research indicates that eating one pink grapefruit per day may help lower cholesterol by as much as 15 percent. Meanwhile, one orange packs in over 110 percent of your daily vitamin C, again boosting immunity and antioxidant function. 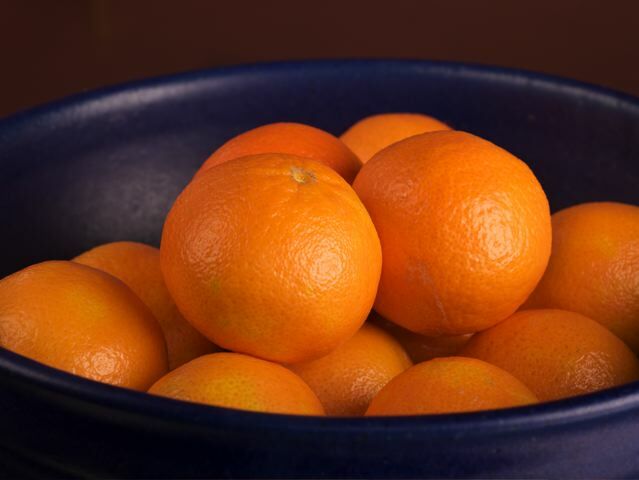 At 35 calories a pop, clementines are a great low-calorie snack. For an elegant, citrus-enhanced dinner, try Poached Halibut with Cilantro Cream and Oranges. Who knew your favorite grande eggnog latte with whipped cream had a whopping 510 calories and 29 grams of fat? Slim it down with a tasty hot chocolate made with skim milk, and skip the whip for just 210 calories and 2 grams of fat. Or have a skim cappuccino (just 80 calories and 0 grams of fat). Delicious as it is, frosting is a calorie-counter's enemy. Skip those tempting frosted sugar cookies and go for the colorful sprinkled sugar cookies instead. You'll lose half the calories and half the fat. Pop the bubbly: At 85 calories per glass, Champagne is a great option for a holiday cocktail or two. At 55 calories a twirl, candy canes aren’t a bad choice to appease your holiday sweet tooth. Make it a mini-cane and cut down on the sugar rush. Forget the fruitcake. A single slice of fruitcake can easily pack in well over 300 calories and 16 grams of fat. Save those calories for a true indulgence you can’t resist, like a piece of apple galette or a gingersnap. p(bio). Marissa Lippert* is a registered dietitian and nutrition consultant in New York City.